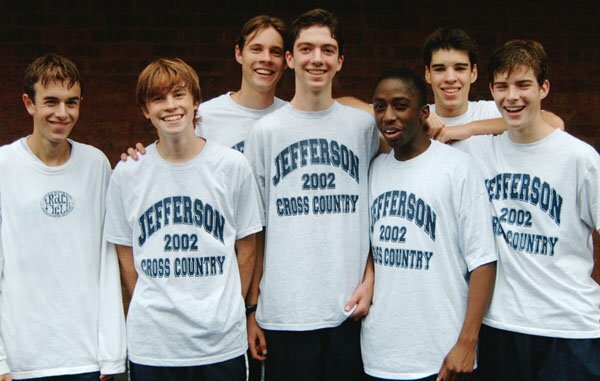 Thomas Jefferson High School, Alexandria, Virginia, made the trip to the William Tennent Invitational because they had no place to race in their home state October 12th. Held in the grip of fear generated by an unknown sniper who had attacked ten times in ten days, area activities had been cancelled. They searched, and found a welcoming meet in PA. And the short trip from northern Virginia to the northern suburbs of Philadelphia seemed like lightyears from home. The unimportant part of the day was that US#9 Jefferson easily won the meet in a neatly packaged 32 points (2-3-5-10-12-18-21). The important part was that several parents, the coaches, and the team got to spend a day without looking over their shoulders. Diane Landrey(3rd from left) is Christo's mom. Christo, a junior, was 2nd to Jamestown, Virginia's Jonna Reinhardt in 15:03. Diane Hanak (far left) is Brian's mom. Brian is most probably off to Yale in a year. Brian finished 5th in 15:39. And Ellen Smith (far right) is Kyle's mom. 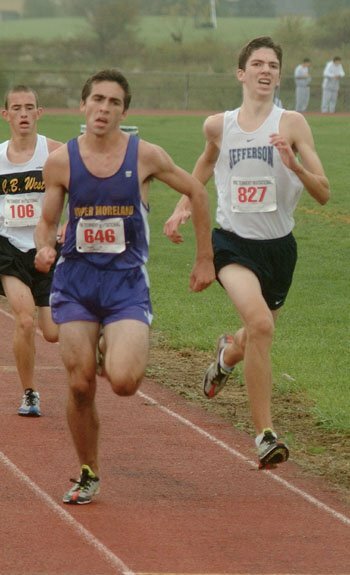 He's a sophomore who finished 12th in 15:57. The three stuck together before, during and after the race. They didn't learn of their destination until they received calls from their sons yesterday afternoon. The three did not disagree with the decision to cancel the very popular (great fan course) Glory Days Grill Invitational in Bull Run Regional Park, Manassas, Virgina. Manassas was the site of shooting #9 earlier this week. The school looked to Charlottesville, Virginia for another meet, but it was deemed to be too close. So they searched north. In-state rival Jamestown has come to William Tennent for years. (Last year's senior star Bryce Ruiz shares the course record with Council Rock star Danny Coval.) They called, along with a few other teams who had been left out by the last minute cancellation. "We were happy to take them" according to Meet Coordinator Ted Abel of William Tennent. "They're going through a very tough time now, and after all, this is for the kids. We had room, so we gladly accepted them." According to the three moms, the varsity is practicing on their own in their neighborhoods, and in a park that is out of the way. "They have to keep running. They can't stop now." They feel their sons are safe at school, because "the schools are in total lockdown. No one gets in they'd don't know." But the pressure is starting to get to them. Ellen says that she was doing OK until the last shooting (Friday morning). "After that, I just didn't want to go out. And Diane Hamak, who volunteers at her son's school every Friday, spent much of the day caught in traffic on I-95 as police searched vehicles looking for the killer, or killers. "My car was even searched by a policeman with a sniper rifle." Jonna Reinhardt, the Jamestown senior who won the race, was a bit concerned about travelling from his home near Williamsburg, through the troubled area around Washington, DC, to Pennsylvania. "We were stopped for two hours. We took a charter bus and when we stopped, we had to stay in a group. It was unnerving." The Jamestown girls team also made the trip, and made a good showing, finishing 6th. The team, the coaches, and Diane, Ellen and Diane were all heading home Saturday evening. They were thankful for the day. "It was nice to get out of the area for a day and take a break," said Diane Hamak. "But if you don't live there, you can't understand. We all knew someone who knew someone affected by the terrorist attack on the Pentagon. Now it's back."